Relax outdoors with the exterior mini fridge right there for any cold drinks you may desire. This is perfect for days when you spend most of you time hanging out at your campsite. Or it’s also just a great place to store all of that extra food your bringing for meals. 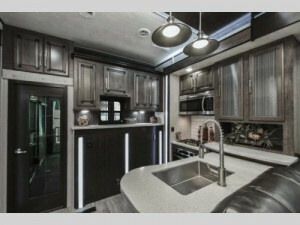 Once you come inside this beautiful, spacious toy hauler, you’ll never want to leave! This RV has space upon space upon space! 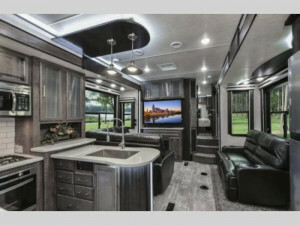 If you’re looking for a toy hauler with just the right amount of class and just the right amount of comfort, THIS is the toy hauler for you, my friend! Heartland did an amazing job in making the Cyclone as spacious as possible and used the design to bring it all together and keep it comfortable for everyone. The kitchen island comes with a backlight fascia, and the Ashlyn cabinets work perfectly to create a classy look (you’ll almost forget you’re camping outdoors with such a home-y feel!). If you’re looking to have some fun with friends, you’ll have no problem keeping all of your food prep in the 18 cu. ft. refrigerator (gas/electric). What better way to prepare a meal than with a deep stainless steel kitchen farm sink? 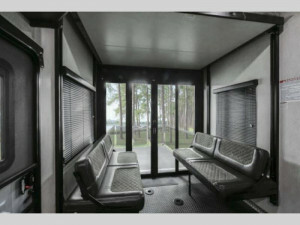 And of course, we couldn’t forget about the beautiful, large garage on the back of this recreational vehicle! Toy haulers are the best way to bring along your outdoor toys, and you won’t think twice about how great this garage is for your bikes! Bring your toys on to the plywood garage flooring and keep them safe on the road with steel D-ring tie downs, and shut them in tight with the 3000 lb. rated ultra-light ramp door! 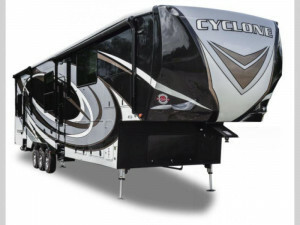 If you have any questions about our Heartland Cyclone Toy Hauler Fifth Wheel for sale, please contact us. We’re always happy to help!